Every year, Pantone — the world-renowned authority of color — announces their "Color of the Year." Each shade serves as an expression of mood and attitude. It is a symbolic selection and a color snapshot of what the iconic company sees taking place in our global culture. Pantone has just announced their color of the year for 2019 — Living Coral. "Color is an equalizing lens through which we experience our natural and digital realities and this is particularly true for Living Coral," says Pantone's Executive Director, Leatrice Eiseman. "With consumers craving human interaction and social connection, the humanizing and heartening qualities displayed by the convivial Pantone Living Coral hit a responsive chord." 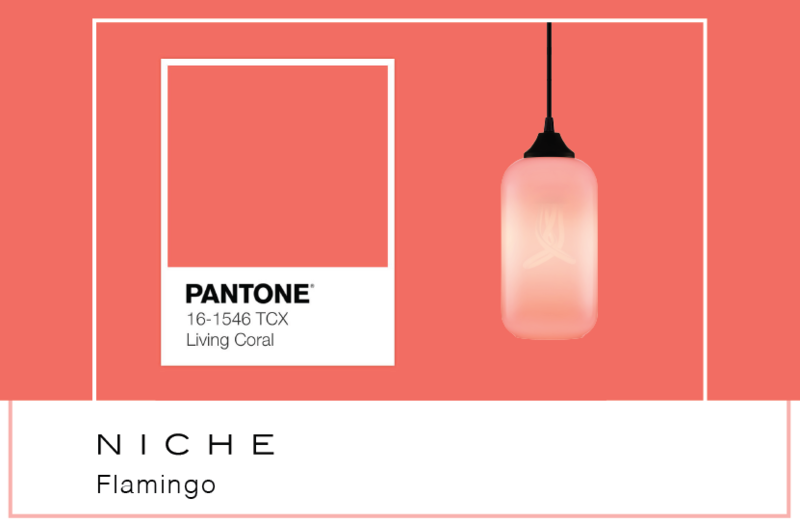 The vibrant, yet mellow color that "welcomes and encourages lighthearted activity" matches Niche's Flamingo Helio pendant. The compact Helio Series in Chroma glass charms and delights. It's sleek enough to stand on its own and simple enough to shine in tightly grouped bouquets from a Pack Canopy. To celebrate Pantone's 2019 Color of the Year pick, Niche is offering a cant-miss deal. For a limited time only, the Helio pendant in Flamingo is in stock and ready to ship. Contact our sales team for exclusive pricing. So, what are you waiting for? It's about time you added some color into your life!